Why should you consider investing in paper plate business? Paper plates are accessories that are used for serving food items at a regular basis. Be it a picnic or a finger food party, the role of paper plates can never be denied. Since these items are lightweight and can be easily disposed off, they are very convenient to be carried to any place for serving food items. These plates are available in a wide range of designs and sizes to meet the needs and preferences of consumers and an occasion or a picnic or an outdoor party in India is really unthinkable without the paper plates. Seen in this perspective, starting your own paper plate business is a great way of earning an extra income every month. The banning of manufacturing and use of plastic plates all across the globe offers a good opportunity for producing and selling eco-friendly paper plates. Owing to the high market demand coupled with the low supply of paper products create an ideal market to launch your own business and earn high profits. Before you start your own paper plate making business, it is important to take a look at the market and its needs in relation with the international market. There are huge demands of paper-made products all across the world owing to the environmental concerns which have prompted the local governing authorities to ban the plastic plates and cups. If you are really serious about taking your business idea to the next level and turn into a reality, you are required to carve out a sophisticated and thoroughly researched plan. A huge proportion of the early business success hangs upon creating a well-documented business plan that can be either created by you or you may choose to hire a professional to for developing the plan. When you have a professional to help you, all your desires and guesswork would be developed into a solid plan with all your business goals in mind. This plan would also help in convincing potential investors that your business ideas and concepts are both plausible and timely. Your first task is to figure out the demand for paper-made plates in the area where you choose to serve. You should be well aware of the customer segments that require paper plates for running their business and some of the major consumer groups can be caterers who are hired to serve food in events and weddings, eateries, food stalls alongside the roads, etc. A ballpark estimate of the demand for paper-made plates in these areas should then be made. For instance, you may figure out the number of caterers in your area, the number of wedding parties and other parties served by them, the total number of paper plates required for the purpose. Demands from other sectors should also be calculated in the same manner. Your next task is to determine the current supply of the commodity within the same geographical boundary and also the demand supply gap. In order to figure out your manufacturing capacity of your business, it is imperative for you to find out what percentage of this demand supply gap do you wish to allocate for. Since you are going to establish a factory and not a retail counter for selling paper plates, location would not be of prime significance. It is better to set up the factory in the outskirts of the city or in particular industrial zones where price of land is not as high as that of a posh urban locale. But make sure that your manufacturing unit is in close vicinity to your intended consumers, supplier of raw materials and possess quality infrastructure in terms of power supplies and connectivity. All you would need is a covered area of approximately 500 square meters with uninterrupted power connectivity to run all the electrical machines. The location should be such that you can effortlessly attract, source and eventually recruit workers for your plant. In simple terms you should be willing to invest an overhead cost of 10,00,000 INR at least for purchasing the equipment as well as raw materials. By investing about 10,00,000 INR, you may expect to manufacture more and more paper plates with a presumed sales turnover crossing 66,00,000. It is better to be registered as a private limited business entity due to the high sales turnover. It will also help you to obtain loans from banks or financial institutions, scale-up much faster and incorporate other partners in the near future. Besides procuring the company registration, you would also have to apply for VAT registration with the governing authorities in order to sell your manufactured products. If you are willing to apply for loans, then you shall have to go through the available schemes and options. Generally, a term loan of 10,00,000 INR along with a working capital worth 15,00,000 INR is needed for setting up of the paper plate making business. You can borrow a sum of up to 10,00,000 INR under the MUDRA Loan Scheme of Indian Government where several banks and financial setups across the country would lend the sum without any collateral. The first stage takes care of carving out the design and pattern of the plate and the encircling area is tapered in the second stage while in the third and final stage, the paper plate is pre-heated and the sides are rimmed and curled to make the process complete. The manufacturing process of paper plates is not at all labour-intense and you would be able to run the entire factory with the help of one production manager, one skilled labourer and one unskilled labourer. It is crucial to estimate the manpower on both managerial and administrative role, needed on the basis of the capacity of the plant. Coming to the supplies of raw material, a paper plate business would require raw items worth 4,00,000 INR each month in the form of bottom reel, printed PE paper and packing material. There are numerous leading manufacturers of automatic machinery of paper plates across the country and you can surely get something to meet your requirements within your budget. Normally the cost of such equipment is about 8,50,000 INR and dyes worth 1,50,000 INR are required for setting up your business. You will have to look for reputed suppliers who can fetch you the raw materials in lead time and extend the credit term if required and you should also have to negotiate better pricing with the supplier by promising timely payment. Make sure that the raw materials are of top notch quality so that you don’t have to compromise with the quality of your manufactured products. The process of manufacturing paper plates is not quite complicated as you can make plates of varying shapes and sizes with the help of specific die. The paper along with the polythene sheets need to be previously cut for proper sizing and you may even purchase these materials pre-cut as per your requirements. The particular die has to be mounted on the press and the die is then heated to the required temperature. Both the layers of paper as well as polythene sheets are placed properly in between the respective die parts and application of pressure helps the product to take its required shape. The product ultimately formed is removed for loading another set. Also, the machine is an ordinary press equipment with two platforms: one fixed and one moving plunger that works through hydraulic mechanism. Afterwards, the bulk of manufactured products are collected and the edges are trimmed and rippled to give it the desired shape and appearance. Then they are packed in a set and dispatched for delivery. The general production capacity of a regular paper plate manufacturing unit is 30,000 to 40,000 in a day per each press on two shift for about 300 days in a year. Since you are a fresh player in the market, you are required to possess a strong value proposition for creating a viable market for your business. So, you will have to segregate the different targeted groups of consumers, their special attributes such as who needs the paper plates in bulk, who can make a prompt payment etc, so that you can scheme distinct marketing strategies for every customer segment. For establishing your identity, you may enter into an agreement with consumers where you may sell the paper plates at a relatively lower cost. Once your target group of consumers is assured of the quality and competitive pricing of your products, you may raise the price. Also, you may choose to enter into long-term agreements with your customers by giving the paper plates at an offer price. But you will have to ensure that the quality of your manufactured products is to class as it is critical to the success of your business. You will have to check the quality at all steps of the value chain right from the raw materials, to the practices in manufacturing to the training of your employees and workers to while transporting the manufactured products to the consumers. You should also take long term quality certifications. Paper-made plates are gaining in prominence all over the globe as a viable means of becoming more environment friendly and reducing exposure to food borne disease and infections. Paper plate demands are mainly originating from IT concerns, educational institutes, industrial canteens, food canteens, roadside café and eateries, coffee shop, fast food centres, super markets and event organisers. Since paper plates are an item of daily use and have a splurge in demands, selling them off and obtaining high profit margin would not be any problem in India. With the aid of well-established market, very high demand and supply forces, the prices of the paper plates can be easily ascertained and sold off to the reputed dealers or traders in bulk or even end consumers through multiple channels. The increase in demand, high employability, recycling of waste paper, production of paper plates of varying designs and sizes are the strengths of the paper industry and as a result, this industry is having huge potential of growth which would lead to socio-economic development, huge demands, good output recyclability, innovative creations of new items and emergence of fresh ancillary industry like packaging and transportation. The paper industry of India itself has its own set of problems that may cast an impact upon the ancillary industries like paper plates manufacturing units. The alterations in economic and technological environment along with the regulatory framework have affected the industry to a great extent. The availability of raw materials, power, water, straw, bagasse, straw, waste paper and cellulose raw materials has an innate drawback of limited access to the suitable technology that can convert these raw stuff into high grade pulp. Plus, paper industry itself is very water intense and producing paper items without the input of water is practically unthinkable. Off late, the most coveted raw materials for the industry is depleting at a fast rate and has already started giving alarming signals at some areas across the country. Moreover, paper industry is one of those 20 highly polluting industries in the country and as a result, the water of numerous rivers is being polluted owing to the ancillary industries of paper. Along with all these problems, paper plates industry is also affected with energy shortage like power and coal and the industry is highly energy intensive where the fuel and power comprise of 25 percent. Seen from all these perspectives, and the corporate civic behavior that’s prompting people to “Save Paper, Save Tree”, the future of paper industry is in doubt owing to the already witnessed efforts of searching for feasible alternatives. I want to paper cap, plates etc…. hi can i meet u . Can u give more details regarding making paper plates etc. I can help you , I have this business. Hello Micky can I get your number. sir, we intend to start the manufacturing venture on disposable articles- all type of raw material , all the range. can you help us project report, profitability, machines, raw material etc. i also want your mobile no for more information about the business …. Hello Micky I want to start this. Give me ideas and brief knowledge of this . I want to start this business, Please provide your number. my number is 9999901385.
dear sir.I’m interesting in paper cup. but i think the machine price is way too high. I am a designer and educated person but please give ideas about eco freindly, quality, marketing and profit detail. i want to start this type business and how i can arrange finance for this business . I am a technical educated person but please give ideas about marketing and profit detail. I want to start paper plate making business, pls help me wr can I get raw materials and also suppliers. you can get raw materials an machine. what time you are free i want talk to you regarding this business. Sir What is the cost of machine and row materials per kg?? Hi , have you started your paper plate business, kindly give me some tips against the same question you thought. I want information about this buisines. overall cost marketing and how to get raw material..
Hii i want to start paper plate and disposal how can i get raw material and supplier. i want to start my own work at faridabad location please tell me how i can start it and about material and machinery. including + Points and (-) points. How to start new paper plate company??? May i know why you want to sell it?? Is the business not worth it?? Im interested to buy ur semi automatic mc can u tell me place which city ur belong brother? I am in chennai i want to start paper plate bussiness pl tell me how can i get raw material& machinery ,how much selling .and positive& negetive point plz details tell me how i can arrange finance for this business . I am educated person but please give ideas about marketing and profit detail. 1. 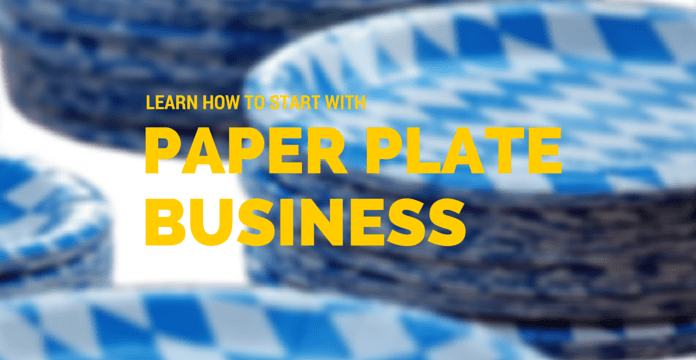 HOW TO START PAPER PLATE BUSINESS? 2. IF ANY OTHER BUSINESS IDEAS IN SMALL AMOUNT PLEASE TELL ME? HOW TO START PAPER PLATE BUSINESS? I want Start Paper plate work for port time please suggest to me. How I start the business. Tell me about negative points regarding paper plate making business and can I trust on buyback agreement ? I Would like to start a paper plates & paper glass business how to consult that person? I Would like to start a paper plates & paper glass business in New Delhi, how to consult that person? I am in Vijayawada i want to start paper plate bussiness pl tell me how can i get raw material& machinery ,how much selling .and positive& negetive point plz details tell me how i can arrange finance for this business . I am educated person but please give ideas about marketing and profit detail. I want to start a paper plate business,please suggest me.. I want to start this business, how to start this business. Give me detail about this business. I am in hyderabad i want to start paper plate bussiness pl tell me how can i get raw material& machinery ,how much selling .and positive& negetive point plz details tell me how i can arrange finance for this business . I am educated person but please give ideas about marketing and profit detail. So plz give ur precious reply. me ideas this business plan. Hi team, I’m planing to start the paper plate business so what will be the next step I heard about this we are soupose to take the training and all let me abt this project. Sir i want to start manufacturing paper plate thali and thermacol dona plate thali. Plzzzzzz give me ideas how to start this. Sir i want to start tharmacole manufacturing disposable dona plate business so plz i need help . i want to start paper plate making business. so plz tel me the details about this business. I am planning to start pepar plate making business at home, please suggest how much initial investment required for this business and where i can get pepar plate making mechine and raw material and how much profit will get. Hi, I m ajay. I want to start this business. Can anybody guide me, how to start this. I would like to start paper cup production businesses in Mysore Karnataka.can you help me more about loan and this business. I would like to start paper plates business in Mysore “Karnataka”. Do you have any suggestions or point of contact in Mysore or Bangalore so that we can meet them directly and proceed further for business. pls send details about paper plat machine. Hi sir supposed I am start this business I will purchased in single die semi – automatic machine monthly how many plates are manufactured and please tell me profit or loss. Send me please my mail id. i am also start this paper dona disposal and plate business but i want to know the margin on per piece so can u please give me detail and where i can arrange raw material. i would like to make connections with folks who already know how to start a paper plate company..any HELP!! I am interested to start the business Manufacturing of Silver Paper Dona. My question regarding the Electricity Connection ? Domestic/Commercial or Industry. Can you provide me G.O. regarding this. Hi this is nagesh I wish to start paper plates business so pls any body let me know manufacturing unit in Bangalore of it. I have recently started this paper plate making business from my home. It is easy to operate with little care. I WANT TO START THIS BUSINESS. BUT I DONT HAVE ANY IDEA OR KNOWLEDGE FOR THE BUSINESS. SO PLZ GIVE FULL DETAIL AGAISNT THIS BUSINESS. i need to start manufacturing of paper disposal products in mumbai so need some experts help .